Rated 5 out of 5 by Smader1 from Works great This juicer works great. It Is extremely easy to clean and you can use a variety of fruits in it. Rated 5 out of 5 by BeccaMama from Great for kids My family loved this citrus juicer! The kids really loved using it...very easy to use! Rated 5 out of 5 by markslady from Easy to use! I've never used a juicer before and I'm glad my first was a Juiceman. Very easy to use and clean up. Juices tasted fantastic, no funny tastes or smells. Great product! Rated 5 out of 5 by miicriic from Works Great, Easy to Clean! I wanted to try out this citrus juicer because mine broke recently. I liked that this citrus juicer was easy to take apart and clean. My old one was difficult to clean and the pulp from the fruit would get stuck in certain places. I think that this juicer worked well, and juiced the fruit like it is suppose to. Rated 5 out of 5 by Citygurl13 from Works great! I've been using this juicer for over a month now and I really love it. It's all plastic, even though it looks a little more durable, but it cleans easily. It's easy to use and can juice 1 orange in less than 1 minute. It's perfect for all juicing fruits and makes great morning drinks!! Also helpful with cooking when I need fresh lemon or lime juice. Would definitely recommend to anyone who likes to juice. Rated 5 out of 5 by littlelost from Easy Peasy Lemon Squeazy! I love this little juicer! I have been juicing large and small citrus in the last couple of weeks. I made lemonade and orange juice a glass at a time as my family asked for it and each time it was a hit. This juicer is very easy to operate and it is easy to store with the cord storage at the bottom. The drop down spout is convenient. There is nothing that is better than fresh juice or lemonade. My husband has picked up a lot of extra oranges and lemons so I do believe he really likes the fresh juice too. Cleanup is so easy. This is a great device to own if you like fresh juice without a big mess. 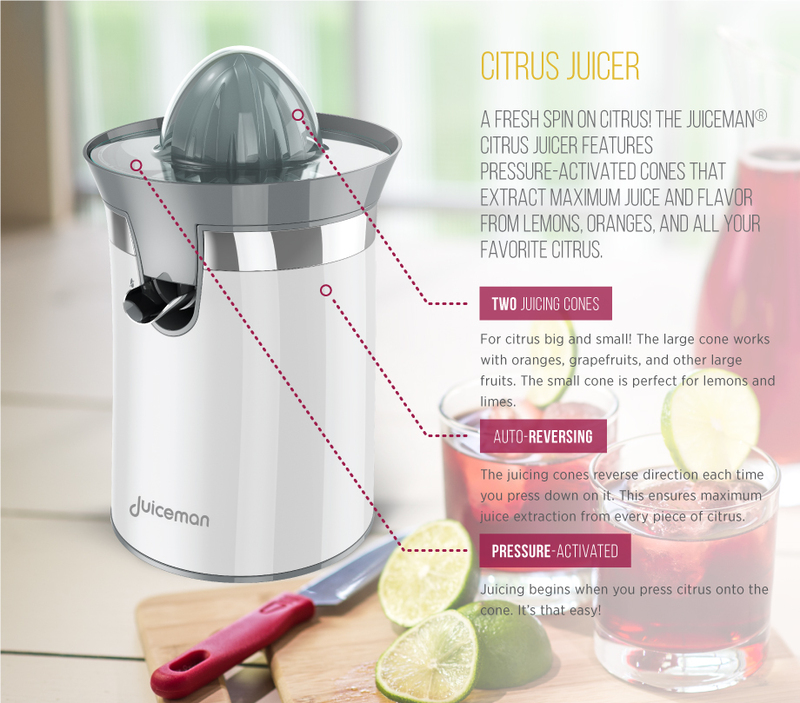 Rated 5 out of 5 by airrescue112 from Well Designed Citrus Juicer I am very impressed by my Juiceman - Citrus Juicer. The design is very well thought out. There is are 2 different size juicing cones for a proper juicing of citrus from lemons to grapefruit. There is a pulp separator so you can add as much pulp as you want to none at all to your liking. The Juicer has a nice drip free spout that you can tilt up to close when not in use. From my cabinet I couldn't find a glass that fit just right. I used a glass that was to short and the juice spilled out on my counter. I am sure if you found a glass the proper height it would work fine. Finally there is a hidden cord wrap in the bottom of the machine. Operation is so simple you could put your kids to work juicing. Just slice your citrus in half and push it down on the juicing cone. The motor automatically starts when you press down that switches direction every press. The multi directional motors helps to get as much juice as possible. The thing I love the most about this product is easy clean up. 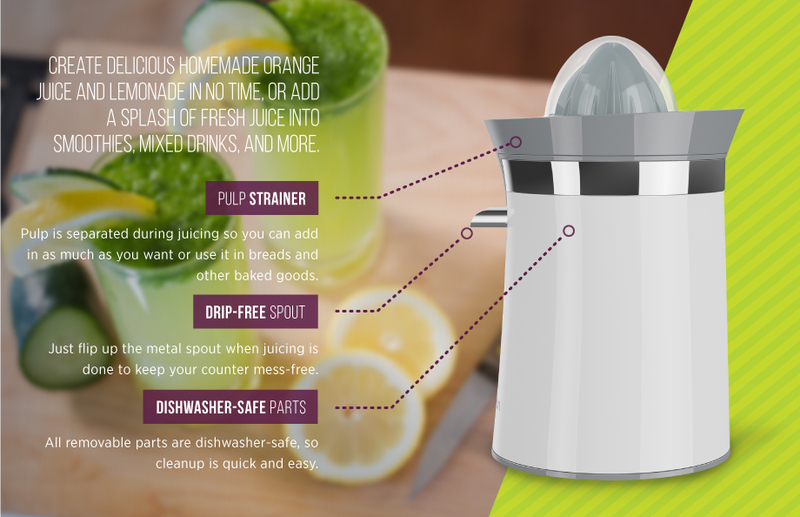 After your are done juicing the machine comes apart easily and the parts are dishwasher safe. If you don't have dishwasher, no problem, it was easy to wash in the sink. Overall I love my Juiceman Juicer and will recommend it to my friends. The price is much more affordable than other brands.